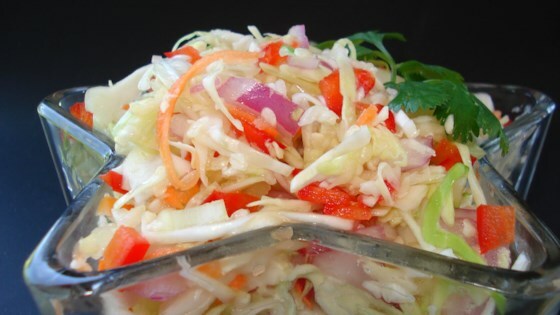 "An absolutely delicious coleslaw, more tart and tangy than the creamy kind. Can make this up to 2 weeks ahead of serving and it only gets better." In a large bowl, combine cabbage, onion, carrots, and celery. Sprinkle with 1 cup sugar, and mix well. In a small saucepan, combine vinegar, oil, salt, dry mustard, and pepper. Bring to a boil. Pour hot dressing over cabbage mixture, and mix well. This is best if made a day ahead to 2 weeks ahead. If you make it far ahead, drain juice prior to serving. This was good. It is flavorful, but not a "wow" recipe. No one commented on it at my party.